Dark Depths comes into play with ten ice counters on it. : Remove an ice counter from Dark Depths. When Dark Depths has no ice counters on it, sacrifice it. 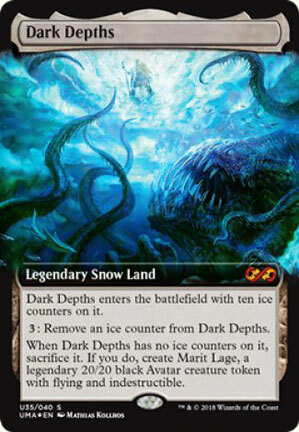 If you do, put an indestructible legendary 20/20 black Avatar creature token with flying named Marit Lage into play. 269 decks jouent cette carte.